Photograph is © L. David Mech, Senior Research Scientist, Biological Resources Division, U.S. Geological Survey. 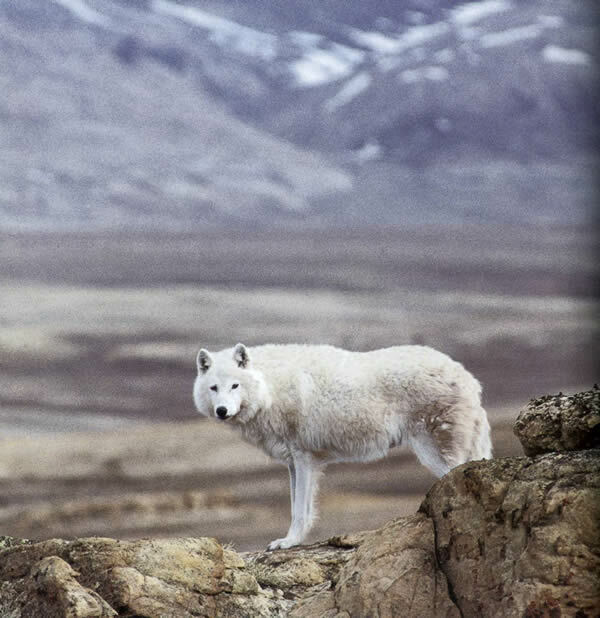 One of the most fascinating creatures inhabiting the Arctic is the arctic wolf (Canis lupus arctos). The arctic wolf is a race, subspecies, or geographic variant of the gray wolf (Canis lupus) species that originally lived throughout the northern hemisphere north of 15°N latitude (12°N latitude in India). Year-around white coats and slightly shorter noses and ears distinguish these wolves from other races of the gray wolf, and the life of the arctic wolf is basically the same as the lives of wolves everywhere. The arctic wolf lives in the area along the northern edge of the North American continent and northward to the North Pole, as well as along the eastern and northern shores of Greenland. Several large islands occupy the region between the north edge of the continent and the Pole. Although ice and snow permanently cover much of the area, parts of these islands become snow free between mid-June and mid-August and support enough low-growing plants to feed musk-oxen, Peary caribou, and arctic hares. These creatures constitute most of the food supply for the white wolves  that live in this place called the "High Arctic." Some white wolves can be found as far south as Wood Buffalo National Park in northern Alberta, Canada, at a latitude of 60°. At least one white wolf has been seen as far south as northern Minnesota. Because wolves sometimes disperse straight-line distances of over 550 miles, conceivably genes of the arctic wolf have found their way to Minnesota. On the other hand, most wolves south of about 70°, which more or less borders the northern edge of continental North America, are gray or black. North of there, most if not all, wolves are white. Coat color is actually a very superficial characteristic with which to evaluate any species. The arctic wolf is a wolf. It is shaped like any other wolf, acts like any other wolf, travels like any other kind of wolf, breeds with any other kind of wolf, and behaves like any other wolf. The High Arctic (75° to 90°N) is mostly unsettled by people. The northernmost Inuit (formerly Eskimo) village, Grise Fiord, nestles at about 75°. This village of about one hundred people was built in the 1950s by the Canadian government, and Inuit from farther south were moved there. The only other year-round human outposts in the region include a few weather stations and a military base. All these settlements are relatively recent. And as a result, arctic wolves really have never been hunted or seriously pursued in most of the High Arctic, contrary to their counterparts throughout the rest of the northern hemisphere. This makes them mostly unafraid of any human beings they do run into. Rather than flee at the very scent of a human, they merely stand and gaze. In some areas, they can even be coaxed up close. Of course, they are very rare, with pack territories covering at least 1,000 square miles. This lack of fear on the part of arctic wolves has allowed the author  to befriend a pack of them. By having discovered their den, the author managed to live with the wolves during summers 1986 through 1996 and to learn many things he could not by working with wolves farther to the south for some 40 years. These experiences, including one instance in which a white wolf came up and untied his bootlaces, are chronicled in a series of articles and publications [3, 4]. 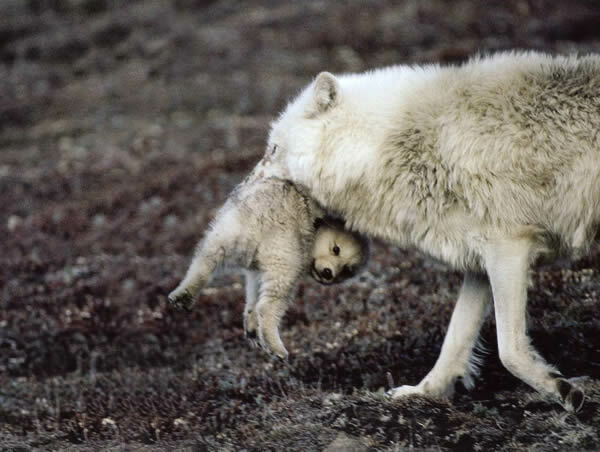 As of summer 2000, all of the wolves he befriended in the earlier years had died, and only one grandoffspring of the original "Mom" of the 1986 pack was left. However, the author and an associate continue to visit the area each summer to study prey populations and any other wolves that might eventually colonize the area. In 2001, 2002, and 2003, even this last grandoffspring was gone, and no wolves were denning in the traditional den or the territory. Probably this was a result of very low numbers of muskoxen and arctic hares in this area. The low prey numbers seem to be related to snow cover during the last half of summer, both in 1997 (Mech 2000) and in 2000. Since then, weather conditions have improved, and prey have begun to increase again. New wolves began to use the area in 2003, and a pair produced 4 pups in 2004, that survived at least until July 15. More wolf photos and other animal photos by the author at http://www.davemech.com/. Although early scientists recognized five races of white wolves in this region, and five or six just to the south, the findings of modern wolf biology tend to imply that technically it is probably more accurate to think of all of the white wolves in the region as belonging to one race. Return to article here. senior research scientist David Mech of the Biological Resources Division, U. S. Geological Survey. Return to article here. National Geographic "At Home With the Arctic Wolf," (1987); National Geographic Explorer video "White Wolf" (1988); Voyageur Press books, "The Arctic Wolf: Living with the Pack" (English, German, French, and Italian), "Wolves of the High Arctic," and "The Arctic Wolf: Ten Years with the Pack," (English, German and Hungarian). Return to article here. Mech, L. D. (1995). Summer movements and behavior of an arctic wolf, Canis lupus, pack without pups. Can. Field Nat. Mech, L. D., M. K. Phillips, D. W. Smith, and T. J. Kreeger. (1996). Denning behaviour of non-gravid wolves, Canis lupus. Can. Mech, L. D. (1997). An example of endurance in an old wolf. Canis lupus. Can. Field Nat. 111(4):654655. patterns of wolves, Canis lupus, from a den at 80°N latitude. Can. Field Nat. 112(3):515517. moschatus, by two Wolves, Canis lupus, and subsequent caching. Can. Field Nat. 113(4):673675. Mech, L. D., P. C. Wolf, and J. M. Packard. (1999). Regurgitative food transfer among wild wolves. Can. J. Zool. 77:11921195. Mech, L. D. (1999). Alpha status, dominance, and division of labor in wolf packs. Can. J. Zool. 77:11961203. hares caused by early winter? Arctic 53(1):6971. Mech, L. D. (2000). Leadership in Wolf, Canis lupus, packs. Canadian Field Naturalist 114(2):259-263. Mech, L. D. (2001). Standing over and hugging in wild wolves. Canadian Field Naturalist 115(1):179-181. Mech, L. D. (2004). Is climate change affecting wolves in the High Arctic? Climatic Change 67:87-93. The author cannot accommodate visitors, photographers, or filmmakers in the field, and the photography opportunities greatly diminished with the demise of the original pack. The new pack has kept its pups in a much less accessible area than the original pack discussed above. The following Canadian agencies have all cooperated with the research via permits, approvals, and logistical support: Polar Continental Shelf Project (PCSP), Atmospheric Environment Services (AES), Department of Defense (DOD), Northwest Territories Department of Resources, Wildlife, and Economic Development, the Nunavut Department of Sustainable Development, and the Grise Fiord Hunters and Trappers Association.